Community Tap/Thomas Creek collaboration gets bottle artwork | Drink. Blog. Repeat. A while back, Upstate beer institutions Thomas Creek and The Community Tap teamed up for a collaboration brew dubbed Trifecta IPA. An citrus-forward American IPA clocking in at 6.9% ABV, the beer was an occasional draft-only release at either the brewery or the store. But, luckily for those of us living outside the Greenville area. Now that the federal government is open, the TTB’s label approval process is off and running again. 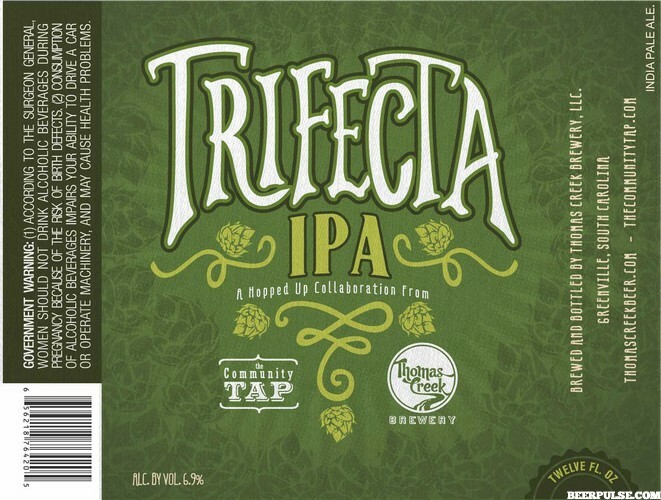 On Monday, Beerpulse, which regularly posts images of approved labels, shared the new bottle artwork for Trifecta. No word on when it’ll be released, but Trifecta will be brewed at Thomas Creek and should be available statewide.